A half marathon in memory of a Darwen fell runner has helped to raise £5,000 for East Lancashire Hospice. The Darwen Half Marathon, organised by Darwen Dashers and sponsored by Heritage Envelopes, saw more than 250 people taking part. Julie Ferguson, who works for Heritage Envelopes, is the daughter of Don Ashton – who passed away from Leukaemia in August at East Lancashire Hospice – and she said it is a lovely tribute to her late father. “He ran for about 30 years, starting from when he was about 40. He was always into sport and still holds some of the local records for fell racing. “Dad received care at the hospice in his final days and they were brilliant. We couldn’t have asked for more. They really looked after him. Heritage agreed to sponsor the event and asked if any proceeds could be donated to the hospice in Don’s memory. 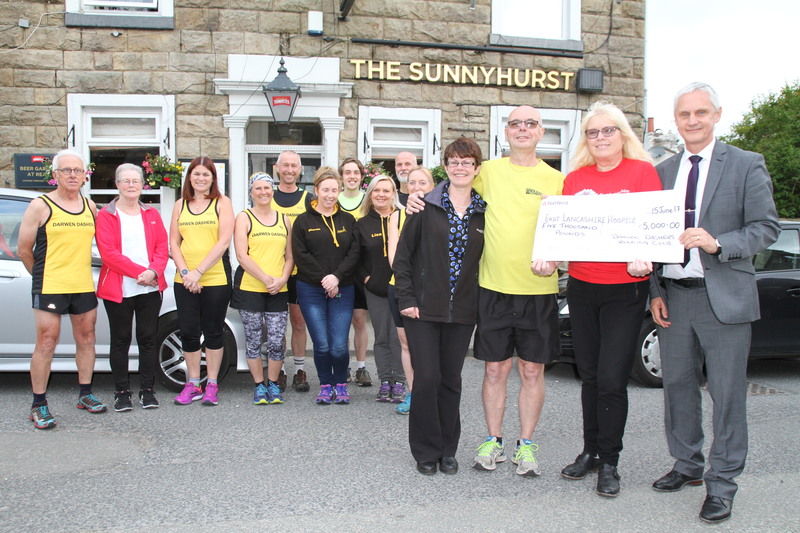 Chris Cash, chairman of Darwen Dashers Running Club, handed over the cheque at the Sunnyhurst Pub, where the group meet every Tuesday and Thursday evening. He said: “We think it’s brilliant to be able to donate £5,000 to the hospice. A lot of members have used the services at the hospice in the past and sadly I’m sure some will in the future.